Today I'd like to share an experience that I had walking through the V and A waterfront in Cape Town. The mall is absolutely beautiful, and there are tons of wonderful shops and restaurants to explore. My friend Christina walked into a lovely little boutique called Avoova, to buy a beautiful bowl decorated with ostrich egg pieces. I wanted to know if this was an ethical practice, because I have noticed a ton of different places selling ostrich egg jewelry in Cape Town. Further research of the store in Cape Town revealed that this particular art store uses egg shards and fragments collected from already broken eggshells on ostrich farms in South Africa. This makes me feel a lot better about purchasing some artwork from the store, because it seems as if the production is not immediately harming any ostrich babies. Ostrich art has been around for an extremely long time. 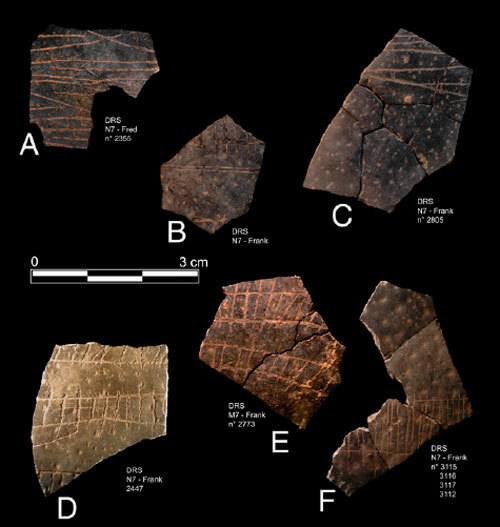 In fact, a 60,000 year old egg shell with designs was found recently in a South African archeological cave site. The designs on the egg shells are thought to depict different artistic motifs from ancient hunter gatherer tribes. The shells showed an impressive amount of diversity in the designs. Here are some of the awesome designs found on the fragments. This article reminded me about the ostrich egg artwork on our Western Cape Sites of Memory trip to the Khoe-San reserve a few weeks ago. Today in the Kalahari, hunter gatherers still practice this sacred artwork! From expensive V and A waterfront stores to hunter gatherer artists, this artwork has definitely made its mark on the culture of South Africa.